An incredible opportunity to learn from these contemporary masters of jazz. Jim Hart, Michael Janisch and Dave Smith share their immense knowledge and experience of composition and arrangement techniques as well as some tricks of the trade in jazz improvisation. The Trio will also take questions in a Q&A session. – An unmissable opportunity for local jazz students and musicians. The Cloudmakers Trio are playing two different gigs at The Jazz Bar on the 8th and 9th of March, both 8.30pm-11.30pm, £10/£8. For the second of their gigs, on the 9th, the Trio are joined by Austrian-born guitarist Hannes Riepler and French-based alto saxophonist Anton Tri Hoang for a collaboration that will see the band exploring their renown cataclysm of exciting rhythmical interplay paired with the two front line voices in what will surely result in their strongest program of original, genre-twisting music to date. Under the leadership of the award-winning multi-instrumentalist Jim Hart (a founding member of London’s Loop Collective), Cloudmakers Trio represents the culmination of over a decade of musical growth between three of the finest musicians currently working on the international jazz, improvised and alternative music scenes. 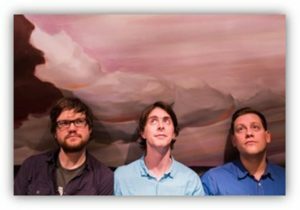 With their uncompromising approach, Cloudmakers Trio effortlessly marry the complex with accessibility, the improvised with composed, and showcase original music that lies somewhere between New York’s downtown sound and the modern European tradition. As a result their music defies easy category yet draws influence from a diverse range of traditions, featuring the under-exploited format of the vibraphone trio. While pushing the boundaries of what can be done with this instrumentation they remain devoted to in the moment risk taking, a deep groove and strong melodies.